Sen. Mitch McConnell is so up to his eyeballs in alligators, he’s long since forgot about cleaning the swamp. No question the senator hears the steady, galloping horses from the tea party extremists closing fast. To be sure, he faces a tough general election against Kentycky Secretary of State Alison Lundergan Grimes – some polls even show him behind. But before he gets to next November he faces the threat of a challenge from within his own party. Wealthy tea party candidate Matt Bevin is definitely nipping at his heals. Maybe that is why McConnell is showing signs of joining the “crazy caucus” – that large band of Republicans who are ready to see a default on the debt, a shutdown of the government, a continuation of the sequester and the defunding of Obamacare – and by virtue of such insane policies, an economic meltdown. They profess to be worried about the deficit and spending yet their policies so far, and their future plans, would see drastic reductions in tax revenue as they stall the recovery, put more people out of work and send us back into a recession. Bad politics, bad economics and bad for America’s middle class. Yesterday, McConnell expressed the need to use the debt for “leverage” against Obama. 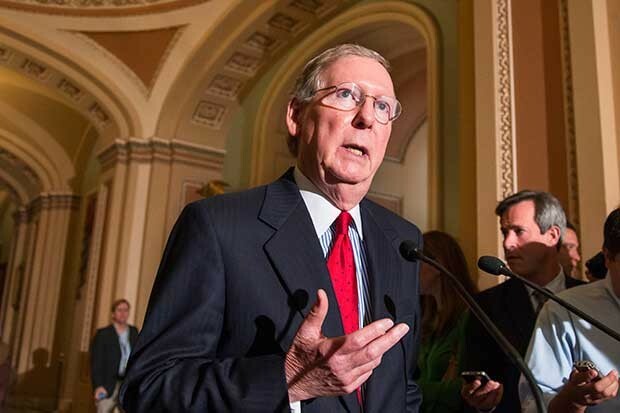 “It’s a hostage worth ransoming,” McConnell has said. He embraced the tea party call for not raising the debt limit and watching America default. Sorry – been there, done that, didn’t work. Maybe the Republicans should follow the example of their hero, President Reagan. The full consequences of a default – or even the serious prospect of default – by the United States are impossible to predict and awesome to contemplate. Denigration of the full faith and credit of the United States would have substantial effects on the domestic financial markets and the value of the dollar in exchange markets. The Nation can ill afford to allow such a result. The risks, the costs, the disruptions, and the incalculable damage lead me to but one conclusion: the Senate must pass this legislation before the Congress adjourns. Reagan, after all, raised the debt ceiling 18 times. So, let’s play this out. If McConnell is so intent on joining the tea party in their efforts what is he risking if Obama calls the bluff of the “crazy caucus”? The full weight of responsible economists, editorial writers, business leaders, reasonable elected officials would come crashing down on him. As the minority leader in the Senate he would not be the engineer of a compromise but rather the creator of chaos. The crazy caucus would become the chaos caucus, led by Mitch McConnell. In short, he would have drunk the Kool-Aid and end up paying for it at the ballot box. He would be loudly criticized as the man who allowed what Reagan warned against to become a reality. Some legacy. My guess is that President Obama has had about enough from the threats, the in-your-face tactics of the tea party. He’ll put his foot down, not be intimidated and let the chips fall. And if I were betting, the Republican “crazy caucus” would morph rather quickly into the “suicide caucus.” And Mitch McConnell would be part of the carnage.